These are pictures of the ICB tanks being set up. This is a picture of some of our members digging a hole for the rainwater basin system. 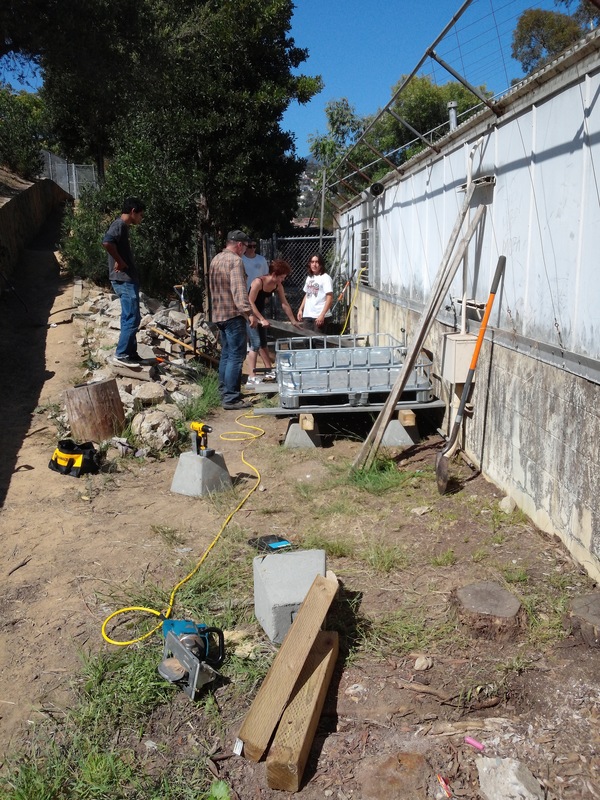 We are currently working on installing a rainwater collection system on both sides of our Green Academy's greenhouse. There will be two different types of rainwater collection systems, one system uses collection tanks and the other system drains the water into a mulch basin. A gutter system needs to be installed onto the roof of the greenhouse to make rainwater collection possible. Four 250 gallon ICB tanks will be installed onto the greenhouse. They will be used to collect and store the rainwater for future use. All of the water we collect will be used to irrigate our garden. This system involves a simple setup of gutters and pipes. Students have worked to dig big holes in preparation for the application of this system. These holes will serve as the basin, where the rainwater will drain into and be held for a long time. Mulch will later be added which will help this basin system act more like a sponge. Members of the outreach committee have visited classrooms to teach children about rainwater collection. The children participated in fun activities including interactive games, coloring and singing songs to help them learn about rainwater collection in a fun and meaningful way.